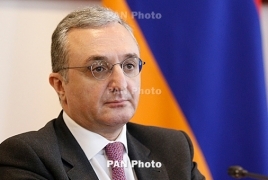 PanARMENIAN.Net - Foreign Minister Zohrab Mnatsakanyan will depart for Moscow on Wednesday, June 6 to meet his Russian counterpart Sergei Lavrov. The Armenian foreign policy chief is also set to meet lawmakers from the State Duma, as well as Armenian students studying in Russia. Ministry spokesman Tigran Balayan said earlier that the OSCE Minsk Group co-chairs will visit Armenia on June 13.